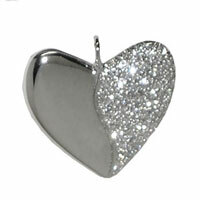 Platinum and Pave Diamond Harmony Heart Necklace: Make a Glittering Statement! This pave set Harmony Heart has just been completed. 38 Full-Cut, Brilliant Diamonds fill half of this heart, solid Platinum fills the other half. These diamonds have a total weight of 0.70 carats. They are F-G color, SI clarity, set within a platinum pendant. The back of the heart is pierced where each diamond is set, allowing extra light to add to their sparkle. The unique Pave Harmony Heart is 7/8" wide. It is suspended on an understated platinum chain. See our full selection of 20th Anniversary Gifts.